The miracle of Siena lies not only in its saints, but also in its art, culture, food, wine and it’s famous medieval Campo where the Palio is run every July and August. A short walk downhill lies La Minerva, a three star hotel with five star views. 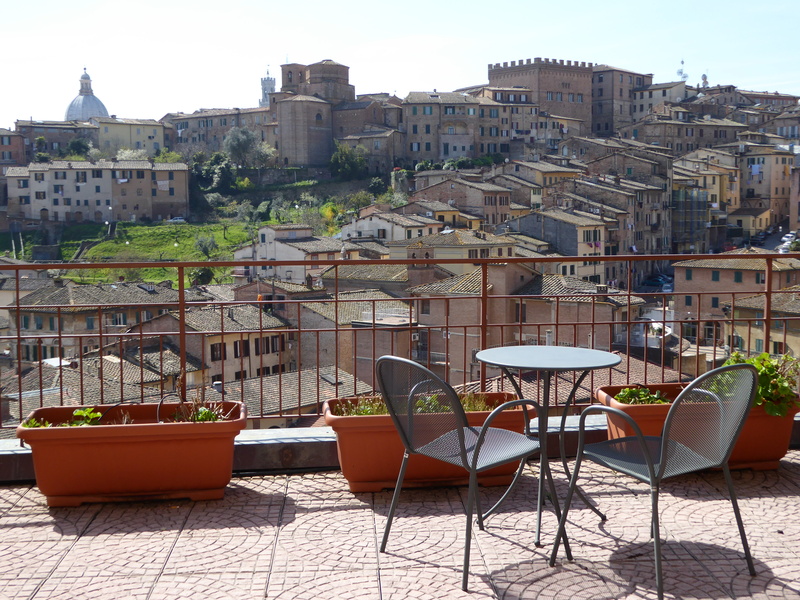 Every room has extraordinary vistas across the juxtaposed terracotta tiled roofs as they climb upwards to the centre of Siena. The rooms, while basic, are meticulously clean and have exceptional good beds, particularly helpful for those in need of a hard mattress and a great night’s sleep. Some rooms offer the additional benefit of expansive terraces, some significantly larger than the rooms, so that with a chianti or espresso in hand from the bar, you can sit outside and enjoy your private viewing as the night folds on one of the most atmospheric Tuscan towns. When Italy slowly awakes, you can roll up the shutters to see the sun gleam across the cathedral’s dome and then meander down to breakfast to experience a warm, traditional taste of Italy. Lorena, your friendly and highly capable barista, will make you a coffee worth waking for: an authentic caffè latte, espresso, even soya or an Americana. There’s not a tacky tourist coffee machine in sight. Instead, as the aroma of real Italian coffee awakens your senses, a great selection of brioche, cheeses, hams, fruit and yoghurts await. It seems Italy really made it into this breakfast.